Our Reusable Name Tags are great for those who want to have name tags on hand with the ability to insert or change names as they wish. The Window name tags can be digitally printed or engraved with your logo. The Dry Erase name tags can be digitally printed with your logo. These Name Tag Holders give you the ability to create your own tag by simply printing your name on a paper insert and inserting it in the holder. Paper inserts not included. Our wooden name tags offer a natural look with many different styles including Oak, Cherry and Red Stained Maple. These name tags are real wood which means you will receive a unique tag with real wood grain. Purchase name tag fasteners individually or in bulk. Keep track of your luggage the professional way with our custom engraved luggage tags. These tags come in a variety of color combinations and are available with different fastener options. Lanyards are very popular for use with ID Badges and ID Badge holders. 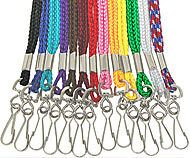 Choose from round, flat or flat break-away lanyards in a variety of colors. 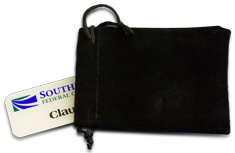 Our Name Tag Protectors are a great way to store your name tag and protect it from scratches. Our metal name tags are Digitally Printed using a permanent printing process. Digital printing allows for unlimited color usage and is perfect for multi-colored logos. These tags are lightweight and durable with several different metal colors to choose from. Metal name tags are also available with our special Epoxy coating and color border options. Our standard plastic name tags come in either smooth plastic or textured plastic. These name tags are laser engraved with your logo and text. Standard plastic name tags also feature a wide variety of color combinations for you to choose from. Blank name tags are great to keep on hand when you need a quick name tag. Simply use a label maker to print out your names for a quick and easy name tag. These Name Tags feature a plastic or metal frame with many color options for an insert. 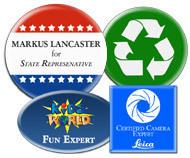 Buttons are a great way to advertise promotions or promote your next campaign. Our buttons are available in many different shapes and sizes, including: round, square and oval. A minimum order of 100 buttons is required.